This work should be preceded by two things. First, students should have an opportunity to explore electric forces on a macroscopic scale by using pieces of plastic that obtain an electric charge when rubbed. Second, students should be introduced to the main concepts in the text below in a lecture-style or class discussion format. They should be shown a full table of the isotopes: one is available from Wikipedia. And this page about three types of radioactive decay. And the Interactive Chart of Nuclides, NuDat 2.4, from the National Nuclear Data Center, Brookhaven National Laboratory. Here is a great glossary of nuclear terminology. In this lesson you will learn about the four fundamental forces of nature and how two of them determine whether an isotope is stable or unstable. Stable isotopes do not decay or change over time. Unstable isotopes produce radiation and are transmuted into different isotopes and different elements. You will learn more about radiation in another lesson. In modern physics there are four forces which, taken together, explain all possible interactions between pieces of matter. The forces are called Gravity, Electro-magnetism, the Strong Nuclear Force, and the Weak Nuclear Force. You are probably already familiar with Gravity since it is the force that keeps you from floating up out of your chair. Gravity is an attractive force between two objects with mass. The strength of gravity depends on the size of the two masses and the distance between them. Gravity acts over all distances but its strength drops off with the square of the distance between two objects. That is, if something is twice as far from the Earth then it will feel a force only 1/4 as great. Gravity never has a repulsive effect. Gravity is responsible for keeping the Moon in orbit around the Earth and the Earth in orbit around the Sun. Gravity is only really important for objects with large masses: its effects are unmeasurable on the scale of atoms and molecules. Electro-magnetism is more complicated than gravity. We will concentrate on just the electric part of this force. Electric forces are much stronger and more versatile than gravity. For example, the force of gravity between two protons in the nucleus of an atom is about 1 × 1036 times weaker than the electric force between the same two protons. Electric forces can be attractive or repulsive (see table at right). As you have seen in the lab, two objects with the same charge repel each other: they push one another away. On the other hand, two objects with opposite charges are attracted to one another. This is where the expression that ‘opposites attract’ comes from. Scientific investigations of electric forces led to calling one kind of charge positive and the other kind negative. Objects with all the positive and negative charges balanced out are called neutral and have a charge of zero. If two charges are positive (or if they are both negative) they will be repelled from one another. But if one charge is positive and the other is negative they will be attracted to each other. Incidentally, it is because of electric forces that you do not fall through the floor and that you cannot push objects right through each other. The electric forces that bind atoms together are very strong and cannot be broken easily. The Strong Nuclear Force is what holds atomic nuclei together. It is a force that is always attractive like gravity but it can only work over extremely short distances: from 1.3 × 10-15 m to 2.5 × 10-15 m. For purposes of this activity it is enough to note that the strong nuclear force acts to make two nucleons attract one another inside an atomic nucleus. The word nucleon stands for either a proton or a neutron, both of which are found in atomic nuclei. This means that the strong nuclear force causes protons to be attracted to protons and neutrons and causes neutrons to be attracted to protons and neutrons. The Weak Nuclear Force is not really important for the purposes of this lesson. It governs certain kinds of radioactive processes and is important for describing how radioisotopes (radioactive isotopes) decay. Radioisotopes are isotopes of an element that are unstable because of unbalanced forces in the nucleus of that isotope. There are two kinds of subatomic particles in atomic nuclei. There are positively charged protons and neutrally charged neutrons. 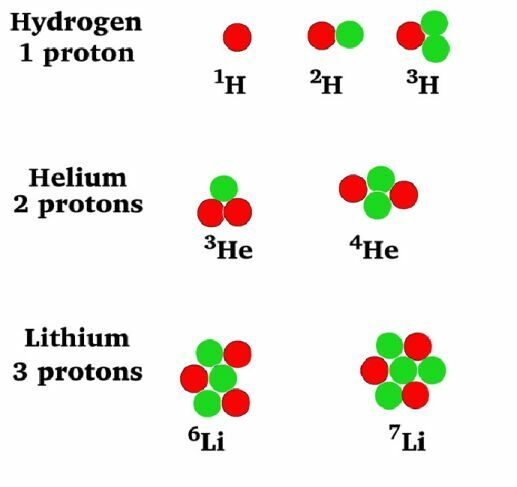 The protons are repelled from one another due to electric forces but neutrons are unaffected. Since they are so close together in the extremely tiny atomic nucleus the repulsive electric force is very, very high. If no other forces were acting then atomic nuclei could not hold themselves together. All the protons, since they are all positively charged, would push each other as far away as possible. The strong nuclear force makes protons and neutrons stick together. It is not quite strong enough to make two protons stick together. The electric repulsion is stronger. But if there is also at least one neutron then the strong nuclear force can balance out the electric repulsion. This works because neutrons are not repelled or attracted by electric forces. They do respond to the strong nuclear force and can help hold atomic nuclei together. For example, take a nucleus with two protons and one neutron. The protons are electrically repelled but the neutron is neither repelled nor attracted. The strong nuclear force acts on all three particles to cause them to be attracted to one another. The neutron contributes just enough extra strong nuclear force to enable the nucleus to hold together. The protons are attracted to each other, too, but without the contribution of the neutron that attraction is not enough to keep the nucleus from being unstable. By the way, what element was used in this example? Isotopes can be stable or unstable. Their stability depends on the balance of forces. If either the electric repulsion or the strong nuclear force is stronger than the other then the isotope will be an unstable radioisotope. A simple way to think about nuclear stability is to consider the ratio of the number of neutrons to the number of protons. Every isotope has some number of protons and some number of neutrons (sometimes the number is zero). The protons alone will not stick together to make an atomic nucleus. Some number of neutrons is necessary to provide enough strong nuclear force to balance the electric repulsion. All of the known isotopes of all of the elements can be shown in a table of isotopes, as your teacher has already shown you. In the graph shown at left all of the isotopes are depicted as small squares placed to show the number of protons (x-axis) and neutrons (y-axis) in each one. There is a line on the graph showing the places on the graph where the number of neutrons equals the number of protons (n0 = p+ or N = Z). In these places the n0/p+ ratio is 1. Some stable isotopes have a n0/p+ ratio close to one but as you add more and more protons the ratio gets larger because more neutrons are needed to provide enough strong nuclear force. Different elements have different stable ratios of neutrons to protons but if they do not have just the right ratio, they will be unstable. Unstable isotopes decay by breaking up or by emitting particles or energy. Most of the unstable isotopes on this graph only exist when they are manufactured in a lab (the empty squares). These radioisotopes decay so rapidly that if they are made by natural processes they are not observed because they have already transmuted into other isotopes by the time scientists come across them. Even though the n0/p+ ratio of some isotopes is not ideal they occur in nature (the squares with dots). These naturally occurring radioisotopes are unstable but do not decay too rapidly and so can be mined from minerals on Earth. Examples include 40K (0.012%, t½ = 1.248 × 109 yrs), 48Ca (0.187%, t½ > 4 × 1019 yrs), 235U (0.7204%, t½ = 7.038 × 108 yrs), and 238U (99.2742%, t½ = 4.468 × 109 yrs). A third kind of radioactive decay occurs when there are too many protons in a nucleus for it to be stable (the n0/p+ ratio is too low). In other words, it happens when the electric force is too strong for the strong nuclear force. This kind of decay can happen in two different ways. 2312Mg → 2311Na + 0+1β. It can be written this way, too: 2312Mg → 2311Na + 0+1e+. 8136Kr + 0-1e → 8135Br. Notice that the electron is added to the nucleus—nothing is emitted! See http://hyperphysics.phy-astr.gsu.edu/hbase/nuclear/nucuni.html#c2 where there is a useful illustration regarding the size of atomic nuclei. Also, the radius of a nucleus is related to the atomic mass number by: r = r0A1/3. The constant r0 = 1.2 × 10-15 m. That is the basis for the size of the carbon-12 nucleus as given below. 2.7 × 10-15 m. The radius of the outermost electron’s orbit in the same atom is about 7.7 × 10-11 m. The volume of that nucleus can be calculated by treating it as a sphere: the volume of a sphere is V = 4/3πr3. According to this the volume of a carbon-12 nucleus is about 8.69 × 10-44 m3 which is 8.69 × 10-38 cm3. Doing the same thing with the radius of the atom’s electrons you find a volume of 1.91 × 10-24 cm3. This is a difference of a factor of 2.2 × 1013! The volume of the nucleus of an atom compared to the rest of the atom is like a marble compared to a giant sports stadium. The nucleus of an atom is extremely dense. The mass of a single carbon-12 nucleus is 1.99 × 10-23 g. So the density of the nucleus is (1.99 × 10-23 g)/(8.69 × 10-38 cm3) = 2.29 × 1014 g/cm3! By contrast, the density of common graphite (a form of carbon) is about 2.2 g/cm3. So the volume of atoms is mostly empty space! 3.76 × 10-10 cm3. This is literally too small to see! Answer questions with complete sentences, when appropriate. Fill in the following table with the required information about the isotopes in the picture at left. What is the meaning of the letter ‘Z’ when speaking about atomic nuclei? What is the definition of the atomic mass number (A)? What is the meaning of the number that often follows the name of an element? When the name of an element is followed by a number (as in calcium-40), what does it refer to, an isotope or an element? Why?. Name and define the four fundamental forces. Describe a stable nucleus. What forces are in balance and how is that balance achieved? Use an example. Describe an unstable nucleus. What forces are unbalanced? There are two ways in which a nucleus can be unstable. Describe both and use examples. What is α (alpha) decay? How does a nucleus that undergoes α decay change? What kind of nuclei decay by α decay? Draw a picture of α decay using the example from the text. What is β (beta) decay? How does a nucleus that undergoes β decay change? What is it about a nucleus that makes it tend to decay by β decay and not some other decay mode? Draw a picture of β decay using the example from the text. What is β+ (beta-plus) decay? What else is it called? How does a nucleus that undergoes β+ decay change? What is it about a nucleus that makes it tend to decay by β+ decay and not some other decay mode? Draw a picture of β+ decay using the example from the text. How does a nucleus that undergoes electron capture change? What is it about a nucleus that makes it tend to decay by electron capture and not some other decay mode? Draw a picture of electron capture using the example from the text. For each of the following problems calculate the volume of the object in cm3 and m3 if its entire mass were compressed to the same density as the nucleus of an atom (2.3 × 1014 g/cm3). To answer the other questions reverse the volume of a sphere calculation to find the radius: V = 4/3πr3 so r = 3√(3V/(4π)). This should give a better sense of its size. Find the radius in cm and m.
Describe the resulting size: Could you hold it in your hand? Would it fill a room? Statue of Liberty: 204.1 metric tons (1 metric ton = 1,000 kg) 46 m tall. Describe the resulting size: Could you hold the world’s population in your hand? Would it fill a room? Are you impressed at the tiny size of the atomic nucleus yet?